In 1808, Lieutenant Thomas Gedney of the United States Coast Survey discovered a deeper channel through “The Narrows” into New York Harbor. This made it easier to bring ships into, and out of, New York harbor. Since 1694, New York has required that all ships coming into New York harbor be guided by an experienced pilot. In 1824, the first American drydock was completed on the East River. By 1825, with the completion of the Erie Canal, New York became the most important transshipping destination that connected the Old World of Europe with the New World of the Americas. The Port of New York and New Jersey is the largest oil importing port and the third largest container port in the nation. THE SEAMASTER PLOPROF 1200M – In 1970 OMEGA officially launched a watch that had been created to withstand the crushing pressures endured by divers working deep below the ocean’s surface. It was the Seamaster Professional 600, the so-called “Ploprof” (from plongeur professionnel – French for “professionaldiver”). It was among the most robust and seaworthy divers’ wristwatches ever made. 1970 PLOPROF – The Ploprof made a bold style statement. Its case could not be mistaken for that of any other watch: the screwed-in crown was located at 9 o’clock under a protective buffer. This unique positioning allowed freer wrist movement and prevented inadvertent manipulation ideal for serious divers. 2016 PLOPROF – The watches in the Seamaster Ploprof 1200M collection have a similar look to the original, but their titanium cases, ceramic bezels on some models and OMEGA Co-Axial and Master Chronometer calibres take the extreme dive watch not only to new depths but also to new heights. In fact, if you’re interested in Omega watch history, check out this incredible interactive timeline on the Omega watch website, here. Omega watches, like all mechanical timepieces, need to have regular maintenance and repairs. 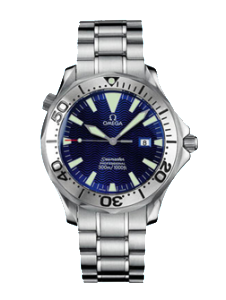 If you have an Omega watch, and are looking for Omega watch repair in New York City, I can help. Simply call up the watch shop, and we can discuss your Omega watch repair needs. If you bring the watch in, I can give you an estimate on any needed maintenance or repairs. Omega watches are truly marvels of engineering, and the story of Omega and its relationship to the sea is one that strongly correlates with New York’s own history. By wearing on Omega, even if you are just a busy businessperson traveling to and fro on the New York City subways, you are showcasing humanity’s relationship not only to time but to the sea. A little history on your wrist is something to be proud of!